Team SV Spirit of Juno is starting to work really well together. Today we placed 2nd in our class for one of our races. 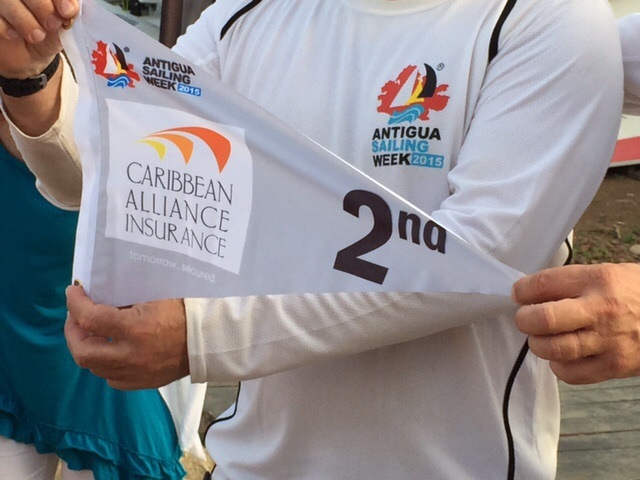 I am starting to understand the attraction behind Antigua Sailing Week (ASW). Buoyed up by our recent success, I’m also feeling quite competitive. Aside from the partying, which is a strong component, ASW attracts people from around the world, who own multi-million dollar yachts. To test the performance of the boats – and compare apples to apples – people want to play with other people who have the same types of toys. Sail racing is an extremely privileged sport. I am fully aware that SV Spirit of Juno is working hard to beat out Lamboughini’s of the sea. And to be honest, at 65 feet, the SV Spirit of Juno is a none-too-shabby performance boat herself. She is just devoid of any plushness. Rumors of billionaires with an attraction for fancy, speedy boats circulate at the ASW. I’ve heard that some people fly their boats from race to race. Apparently, this keeps their boats pristine, and ensures a firm date of delivery. They dissemble their boats for the airplane and reassemble them on the other end. 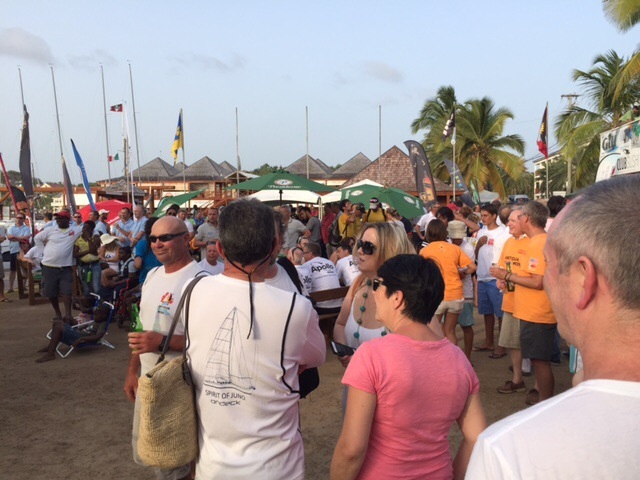 Antigua is the perfect location for sail racing. The winds and the sea water are warm. It feels very safe and compact here. People are very friendly. There is no need to rent a car. Most everything can be reached on foot in Falmouth Harbor. Antigua doesn’t have major highways, but they do have a quirky ride program. For five dollars you can rent a donkey to take you home. The photo below cost me a dollar. I refused the owner’s marriage proposal. Been drinking? 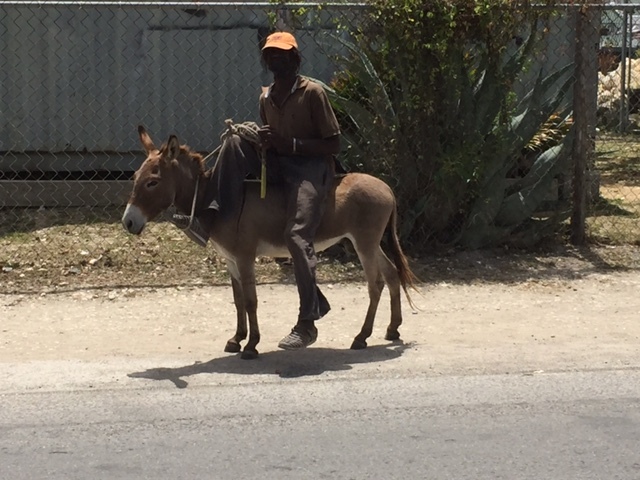 This is Antigua’s ride-home donkey. I’m going to a party this evening at Nelson’s Dockyard. The partying starts as soon as people get off their boats. Here is a picture of the beer garden during the awards ceremony. Our skipper, Tony, is walking on the left side of the photo. When you rent the donkey, does it have to take you straight home or can it hang out at the bar and drink beer with you for a while first?